A scanning electron microscope (SEM) image of a single human lymphocyte. A lymphocyte is one of the subtypes of a white blood cell in a vertebrate's immune system. Lymphocytes include natural killer cells (which function in cell-mediated, cytotoxic innate immunity), T cells (for cell-mediated, cytotoxic adaptive immunity), and B cells (for humoral, antibody-driven adaptive immunity). They are the main type of cell found in lymph, which prompted the name "lymphocyte". A stained lymphocyte surrounded by red blood cells viewed using a light microscope. The three major types of lymphocyte are T cells, B cells and natural killer (NK) cells. Lymphocytes can be identified by their large nucleus. T cells (thymus cells) and B cells (bone marrow- or bursa-derived cells[a]) are the major cellular components of the adaptive immune response. T cells are involved in cell-mediated immunity, whereas B cells are primarily responsible for humoral immunity (relating to antibodies). The function of T cells and B cells is to recognize specific "non-self" antigens, during a process known as antigen presentation. Once they have identified an invader, the cells generate specific responses that are tailored to maximally eliminate specific pathogens or pathogen-infected cells. B cells respond to pathogens by producing large quantities of antibodies which then neutralize foreign objects like bacteria and viruses. In response to pathogens some T cells, called T helper cells, produce cytokines that direct the immune response, while other T cells, called cytotoxic T cells, produce toxic granules that contain powerful enzymes which induce the death of pathogen-infected cells. Following activation, B cells and T cells leave a lasting legacy of the antigens they have encountered, in the form of memory cells. Throughout the lifetime of an animal, these memory cells will "remember" each specific pathogen encountered, and are able to mount a strong and rapid response if the same pathogen is detected again; this is known as acquired immunity. NK cells are a part of the innate immune system and play a major role in defending the host from tumors and virally infected cells. NK cells distinguish infected cells and tumors from normal and uninfected cells by recognizing changes of a surface molecule called MHC (major histocompatibility complex) class I. NK cells are activated in response to a family of cytokines called interferons. 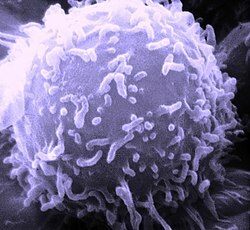 Activated NK cells release cytotoxic (cell-killing) granules which then destroy the altered cells. They are named "natural killer cells" because they do not require prior activation in order to kill cells which are missing MHC class I.
Mammalian stem cells differentiate into several kinds of blood cell within the bone marrow. This process is called haematopoiesis. All lymphocytes originate, during this process, from a common lymphoid progenitor before differentiating into their distinct lymphocyte types. The differentiation of lymphocytes follows various pathways in a hierarchical fashion as well as in a more plastic fashion. The formation of lymphocytes is known as lymphopoiesis. B cells mature into B lymphocytes in the bursa equivalent, which in humans is the GALT, which is thought to be located in the Peyer's patches of the intestine, while T cells migrate to and mature in a distinct organ, called the thymus. Following maturation, the lymphocytes enter the circulation and peripheral lymphoid organs (e.g. the spleen and lymph nodes) where they survey for invading pathogens and/or tumor cells. The lymphocytes involved in adaptive immunity (i.e. B and T cells) differentiate further after exposure to an antigen; they form effector and memory lymphocytes. Effector lymphocytes function to eliminate the antigen, either by releasing antibodies (in the case of B cells), cytotoxic granules (cytotoxic T cells) or by signaling to other cells of the immune system (helper T cells). Memory T cells remain in the peripheral tissues and circulation for an extended time ready to respond to the same antigen upon future exposure; they live weeks to several years, which is very long compared to other leukocytes. 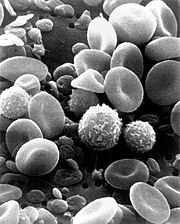 A scanning electron microscope image of normal circulating human blood showing red blood cells, several types of white blood cells including lymphocytes, a monocyte, a neutrophil and many small disc-shaped platelets. Microscopically, in a Wright's stained peripheral blood smear, a normal lymphocyte has a large, dark-staining nucleus with little to no eosinophilic cytoplasm. 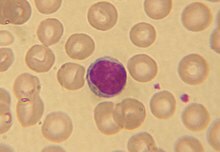 In normal situations, the coarse, dense nucleus of a lymphocyte is approximately the size of a red blood cell (about 7 μm in diameter). Some lymphocytes show a clear perinuclear zone (or halo) around the nucleus or could exhibit a small clear zone to one side of the nucleus. Polyribosomes are a prominent feature in the lymphocytes and can be viewed with an electron microscope. The ribosomes are involved in protein synthesis, allowing the generation of large quantities of cytokines and immunoglobulins by these cells. It is impossible to distinguish between T cells and B cells in a peripheral blood smear. Normally, flow cytometry testing is used for specific lymphocyte population counts. This can be used to determine the percentage of lymphocytes that contain a particular combination of specific cell surface proteins, such as immunoglobulins or cluster of differentiation (CD) markers or that produce particular proteins (for example, cytokines using intracellular cytokine staining (ICCS)). In order to study the function of a lymphocyte by virtue of the proteins it generates, other scientific techniques like the ELISPOT or secretion assay techniques can be used. In the circulatory system, they move from lymph node to lymph node. This contrasts with macrophages, which are rather stationary in the nodes. 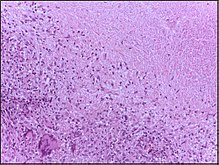 Several lymphocytes seen collected around a tuberculous granuloma. A lymphocyte count is usually part of a peripheral complete blood cell count and is expressed as the percentage of lymphocytes to the total number of white blood cells counted. A general increase in the number of lymphocytes is known as lymphocytosis, whereas a decrease is known as lymphocytopenia. An increase in lymphocyte concentration is usually a sign of a viral infection (in some rare case, leukemias are found through an abnormally raised lymphocyte count in an otherwise normal person). A high lymphocyte count with a low neutrophil count might be caused by lymphoma. Pertussis toxin (PTx) of Bordetella pertussis, formerly known as lymphocytosis-promoting factor, causes a decrease in the entry of lymphocytes into lymph nodes, which can lead to a condition known as lymphocytosis, with a complete lymphocyte count of over 4000 per μl in adults or over 8000 per μl in children. This is unique in that many bacterial infections illustrate neutrophil-predominance instead. A low normal to low absolute lymphocyte concentration is associated with increased rates of infection after surgery or trauma. One basis for low T cell lymphocytes occurs when the human immunodeficiency virus (HIV) infects and destroys T cells (specifically, the CD4+ subgroup of T lymphocytes). Without the key defense that these T cells provide, the body becomes susceptible to opportunistic infections that otherwise would not affect healthy people. The extent of HIV progression is typically determined by measuring the percentage of CD4+ T cells in the patient's blood – HIV ultimately progresses to acquired immune deficiency syndrome (AIDS). The effects of other viruses or lymphocyte disorders can also often be estimated by counting the numbers of lymphocytes present in the blood. In some cancers, such as melanoma and colorectal cancer, lymphocytes can migrate into and attack the tumor. This can sometimes lead to regression of the primary tumor. Reference ranges for blood tests of white blood cells, comparing lymphocyte amount (shown in light blue) with other cells. ^ The process of B-cell maturation was elucidated in birds and the B most likely means "bursa-derived" referring to the bursa of Fabricius. However, in humans (who do not have that organ), the bone marrow makes B cells, and the B can serve as a reminder of bone marrow. ^ "B Cell". Merriam-Webster Dictionary. Encyclopaedia Britannica. Retrieved 28 October 2011. ^ a b Janeway, Charles; Travers, Paul; Walport, Mark; Shlomchik, Mark (2001). Immunobiology (5th ed.). New York and London: Garland Science. ISBN 0-8153-4101-6. .
^ a b c Abbas, A. K.; Lichtman, A. H. (2003). Cellular and Molecular Immunology (5th ed.). Saunders, Philadelphia. ISBN 0-7216-0008-5. ^ Kumar, Abbas Fausto. Pathologic Basis of Disease (7th ed.). ^ Berrington, J. E.; Barge, D.; Fenton, A. C.; Cant, A. J.; Spickett, G. P. (May 2005). "Lymphocyte subsets in term and significantly preterm UK infants in the first year of life analysed by single platform flow cytometry". Clinical and Experimental Immunology. 140 (2): 289–92. doi:10.1111/j.1365-2249.2005.02767.x. PMC 1809375. PMID 15807853. Wikimedia Commons has media related to Lymphocytes. "Cytotoxic T Lymphocyte". Cell Centered Database. "Overcoming the Rejection Factor: MUSC's First Organ Transplant". Waring Historical Library. This page was last edited on 22 March 2019, at 10:01 (UTC).